Welcome to the website of the Eustace Street Meeting House. The Religious Society of Friends (better known as Quakers) have worshipped on Eustace Street for over 300 years. Situated at the heart of Dublin city centre, in the Temple Bar area, our Meeting House welcomes Friends and attenders from Dublin and all over the world. Eustace Street Meeting is part of Dublin Monthly Meeting, the group of Meetings in the Dublin area. 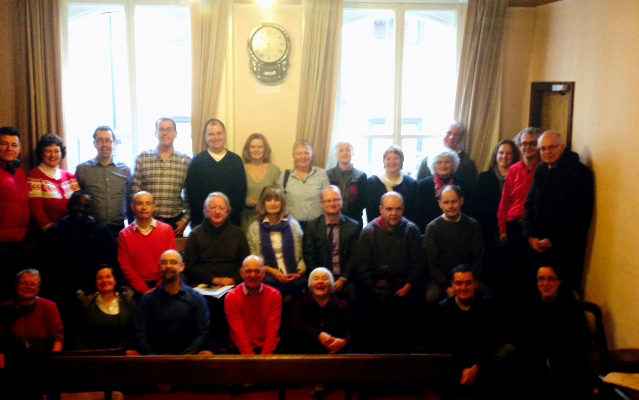 Other Quaker Meetings in Dublin are in Churchtown, Monkstown and Rathfarnham. Eustace Street Meeting is officially known as Dublin Preparative Meeting, and is a registered charity (RCN: 20141493, CHY20444). Our website provides information about the Eustace Street Meeting House and our Quaker interpretation of Christ’s message. We hope that you find this website informative and useful. If you have any queries or wish to comment on the website, please contact us. Meeting for Worship is at 11 am until 12 noon on Sundays. There is also Meeting for Worship between 6.15 pm until 6.45pm every Thursday. Although children are welcome, usually there is no Sunday School so we would need advance notice of Sunday School requirements. Eustace Street Meeting House is a city centre based Dublin Meeting House. Eustace Street runs between Dame Street and the south quays. South Great George’s Street is opposite the Dame Street end, and the Millenium Bridge is opposite the other end. From the Central Bank, walk up Dame Street (towards Christ Church). Turn right into Eustace Street, which is the fourth turn to your right. The Meeting House is at 4-5 Eustace Street in Temple Bar, on the left hand side of Eustace Street beside the Irish Film Institute. There is usually a door keeper to greet you. If not, at the glass door entrance ring the bell for the Meeting House. When the front door has been opened, go up the stairs to the first floor and turn left. View location of Eustace Street Meeting House. Bus – The Meeting House is within easy walking distance of most city centre bus termini. Find out information on Dublin Bus services. Rail – Tara Street DART station is the closest railway station to the Meeting House. Find out information on Irish Rail services. Luas – We are less than a 5 minute walk from Jervis Luas Stop on the Red Line (directions). The closest Green Line stop is St.Stephen’s Green, 10 minutes away (directions). Limited free parking is available along the north quays (Inns Quay and Ormond Quay) on Sundays.